The wild boar plays a very important role in many aboriginal societies in Taiwan. To this particular artist, the wild boar is also very significant. Fuzu Hamowana (also known as Pu’u) lives in Laiji Village in Alishan, which according to legend was discovered during the hunt for wild boar. She raised a wild boar as a pet when she was young, only to find out that one day while she was away that her mother had slaughtered it for food. This event left a very deep impression on her. The front of this wooden block features an imprinted wild boar in yellow, with the eye region and body striping hand-carved. On the back is a hand-painted depiction of the Tsou tribe’s sacred mountains with the crest line hand carved. On the top is a hand-painted bunch of millet stalks. Millet was the staple food of traditional indigenous societies, and is still used today. 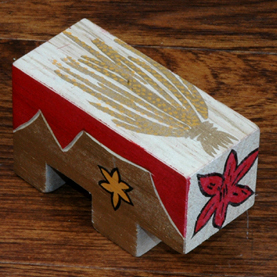 This is one of a set of four hand painted wild boar-themed blocks. Buy these blocks individually or as a set and display them, to do your part to raise awareness of Taiwan’s indigenous Tsou culture. Fuzu Hamowana is a member of the Tsou tribe of Taiwan, living in Laiji Village in the Alishan (Mt. Ali) area. She spent much of her youth in urban areas, returning to her mother’s village ten years ago. She is already an accomplished artist having mastered ceramics, oil painting and wood carving. Fuzu Hamowana is currently focused on wood art with the wild boar, a traditional food source for the tribe, as the main theme. One day while she was away from the village her mother slaughtered her pet boar for food, an experience that influences her art today.